Vermont Protective Coatings has the equipment and expertise to properly prepare and coat all types of steel and concrete structures. 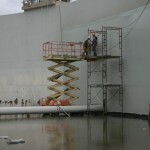 We specialize in bridges, tanks, piping, penstocks, and structural steel. We have over thirty years of experience and we are certified for lead paint removal as well. Our customer list includes general contractors, state agencies, manufacturing facilities, mineral processing facilities, electric utilities, water treatment districts, waste treatment plants, colleges and universities, and ski areas. 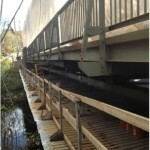 Proper preparation is the key to a long lasting paint job on any steel structure. Our trained crews can provide surface preparation to meet any of the various SSPC (Society for Protective Coatings) standards. We have long standing relationships with leading coating companies such as Carboline, PPG Devoe, Tnemec, and Sherwin-Williams. 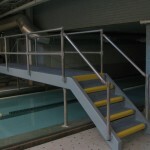 We can use our technical contacts with these companies to help specify a surface preparation standard and a coating system to meet your needs. All of our equipment is mobile, so we can bring all of our capabilities to your site. We have all sizes of blasting equipment including a Schmidt 8 ton mobile blast pot. 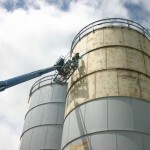 We are experienced at building containment structures to contain the dust generated from sandblasting operations and have 5,000 cfm and 24,000 cfm dust collectors available to minimize any dust issues at your site. We also have experience rigging “difficult” projects and are glad to meet with you to discuss options for accessing and scheduling your project. We stock a variety of specialty abrasives such as corn cob, walnut shell, garnet, and calcium carbonate for use on a wide variety of substrates. Work can also be done at our yard and shop located in Brandon, VT. Our shop is heated so coatings can be applied in any season. Contact us to discuss your needs and to set up a time for us to come to your facility to look at your project.